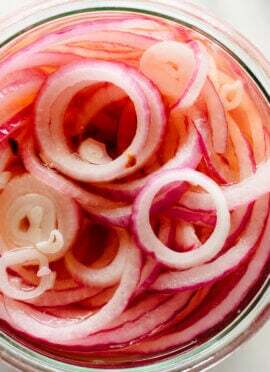 Forget everything you know about pickled relish! This jalapeño relish is fresh, bright and spicy, but not too spicy. It’s unsweetened, but the apple cider vinegar does tame the jalapeño heat a bit. 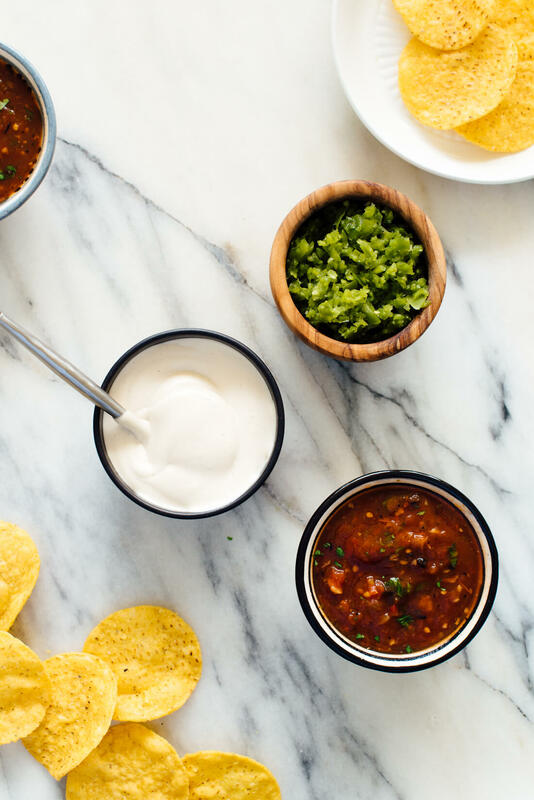 This relish is for more than sandwiches and hot dogs—think nachos, quesadillas, tacos and burritos, too. Jalapeño relish will liven up your Fourth of July leftovers, and it makes staples like scrambled eggs and beans and rice much more exciting. Basically, anywhere you would add pickled jalapeños, you can use this homemade relish instead. If you’ve ever tried pickling your own jalapeños, you know that hot vinegar combined with spicy peppers makes you cough and fills the kitchen with the undesirable fragrance of vinegar. So, this relish is the perfect homemade alternative to pickled jalapeños. This no-cook, hands-off version is irresistible, and keeps well in the refrigerator for a week or two. Are you as excited about this as I am? This “relish” idea came from a Mexican restaurant far from Mexico, near Glacier National Park in Montana. My family and I found ourselves there after a big hike and we were famished. The place was packed, which was a good sign. But the bartender gave me a funny look for requesting a glass with a salted rim for my Mexican beer, which was a bad sign. After surveying the tables around me and reviewing the vegetarian options on the menu, I settled on the vegetarian nachos. To my delight, I found their “jalapeño purée” nestled between the chips and the cheese, and I loved it. So much so that I asked if we could eat there again the next night. Options were limited, and I was obsessed with the jalapeño purée! “Purée” is not a Spanish word and the sauce wasn’t completely smooth, anyway. I was almost tempted to call this stuff “chunky hot sauce” (ew). Relish seemed like the best descriptor, since the jalapeños are chopped up very small in the food processor. This jalapeño relish is perfect for your jalapeño garden surplus, and it’s super simple to make. I’ve gone through a whole jar myself within a week—I like it that much. 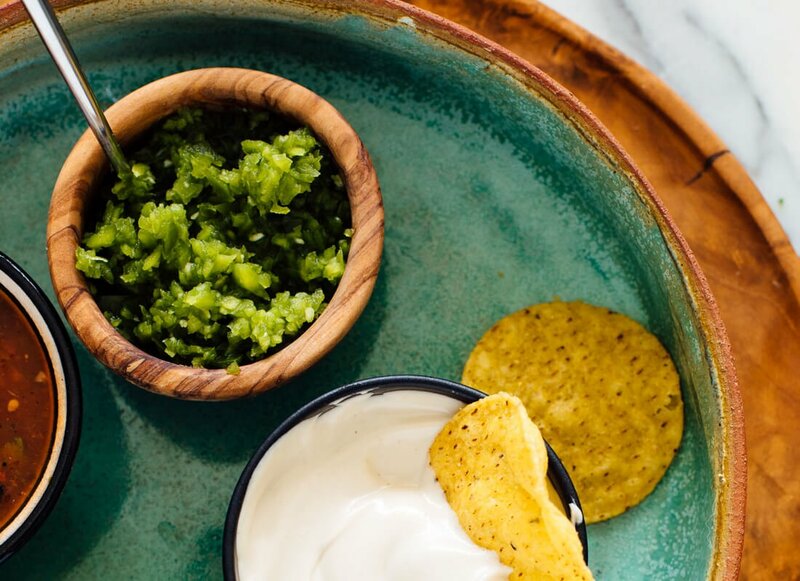 Looking for Mexican dips to serve with this relish? 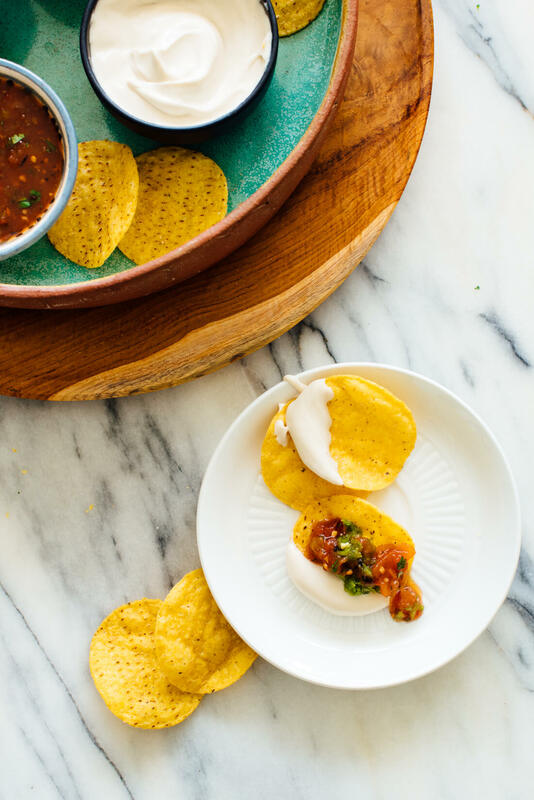 Check out my favorite red salsa, vegan sour cream, creamy avocado dip and easy refried beans. Craving more spicy sauces? Don’t miss my shatta recipe (Middle Eastern hot sauce) or zhoug recipe (spicy cilantro sauce, also from the Middle East). Please let me know how you like this recipe in the comments! I’m excited to hear how you put this fresh and spicy relish to use. 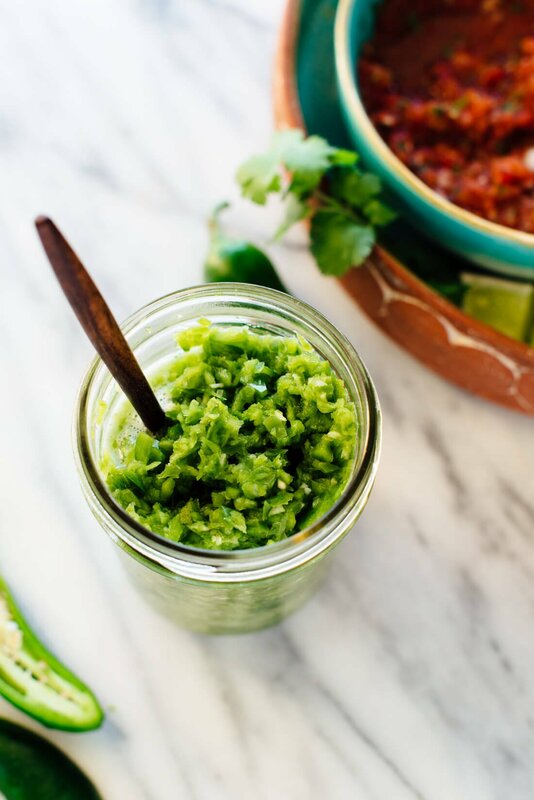 If you love pickled jalapeños, this easy homemade jalapeño relish is for you! Dollop this versatile sauce onto sandwiches or hot dogs, nachos, eggs, rice and beans, etc. 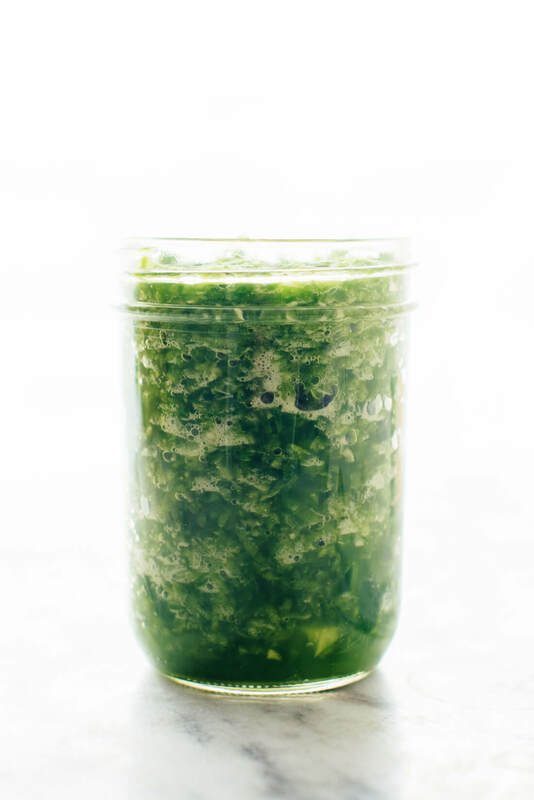 Recipe yields about 16 ounces, so it’s perfect for a pint-sized mason jar. To prepare the jalapeños (wear food-safe gloves if you have them or just try to avoid skin contact with the cut jalapeños): Cut off the tops of the jalapeños and discard the stem ends. Halve the peppers lengthwise, then remove the seeds and membranes (reserve the seeds to add later if your relish isn’t spicy enough). Set aside. 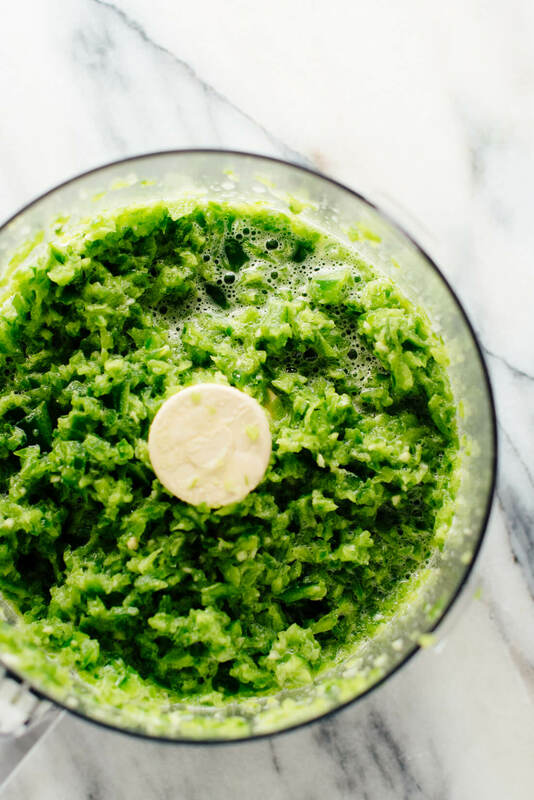 Place the garlic in your food processor, and process until the garlic is chopped into small pieces, scraping down the sides as necessary. This should just take about 10 seconds. Place the jalapeños in the food processor. Process until the jalapeños are chopped into a teeny tiny pieces, but stop before they are a wet purée. Stir in the apple cider vinegar and salt. Taste, and if it’s not spicy enough for your liking, stir in some of the reserved jalapeño seeds. Transfer the mixture to a pint-sized mason jar and chill for at least 1 hour. Serve as desired. Store leftover relish in the refrigerator, covered, for 1 to 2 weeks (it tastes best fresh). Recipe inspired by Serrano’s Mexican Restaurant in East Glacier, Montana. Can I can it? 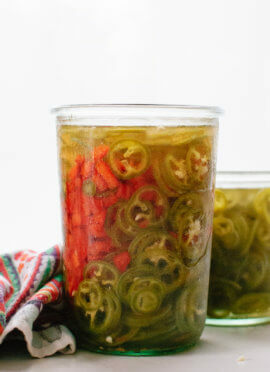 This recipe has not been validated for canning safety, so please do not can these jalapeños. They will keep in the refrigerator for 1 to 2 weeks. Could you can this recipe and dish out in a few months? Hey Kevin, that’s a good question. 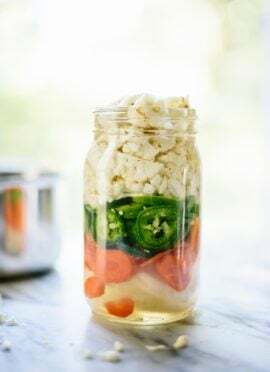 Unfortunately I’m not a canning expert, and this recipe has not been validated for safety, so please don’t can this recipe. omg, I am obsessed w/ground jalapenos… There’s a local Mexican restaurant near my office and literally the only reason I go there is to get their Mexican pizza which has dollops of ground jalapenos on it. It’s also vegetarian with beans and cheese on it, but the JALAPENO’s make it! Theirs are not pickled, and this sounds so much better. 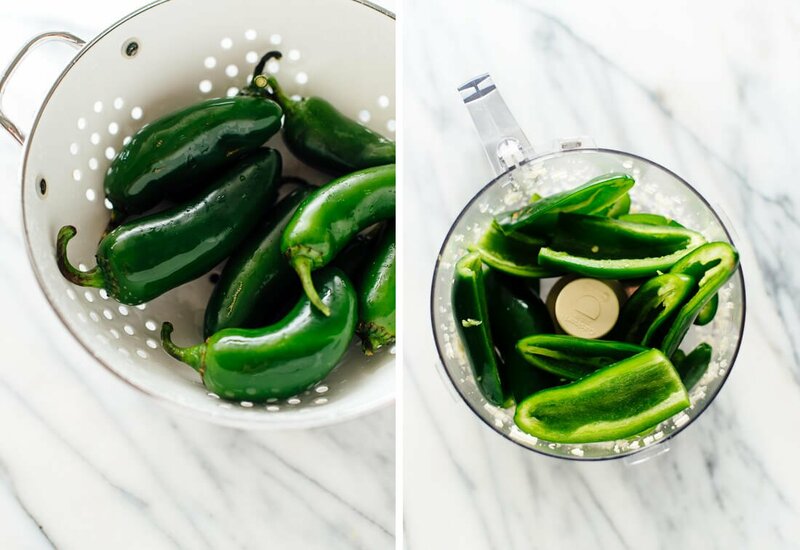 It’s the beginning of jalapeno season around here too, so I can see myself picking up quite a few jalapenos from the farmers market in the coming weeks and making a few jars of this stuff! YUM! Thank you for sharing! I appreciate it. Just picked up ½ pound of jalapenos yesterday to make a new escabeche recipe I found. I think I’m going to wait on that one and try your recipe instead. YUM! this looks and sounds soo good. Making some for sure! thanks for the recipe!! This looks GREAT. I always keep a good chili pepper relish around for quick toppings or swirling into dishes for a bit of zing. This one is a keeper for sure. Instead of the vinegar, would lime juice work? You do really need the vinegar for this recipe, but feel free to try it. Ok you are my jalapeno HERO! I always buy that big bag of them from Trader Joe’s and never know what to do with the rest of them! Ha, well thank you! Let me know what you think, Abby. Need to keep a jar of this in my kitchen! I made this the other day, and am now putting it on everything! Next time, I would add the vinegar a little sooner and pulse in processor instead of stirring it in afterwards. We’re having a banner jalapeño season, so I just went out to the garden, picked a batch, and made your recipe. Yum! It was all I could not to eat it all before sharing with my husband ;) Thanks for sharing this recipe! Fresh from the garden! Love that. Thanks for sharing, Tammy. Can’t wait to make this relish! Seems super easy. I dislike canning and have been looking for a recipe so I can use up my extra jalapeños! Let me know what you think, Denise! Made the jalapeño relish yesterday. It really is, not only easy and simple to prepare, but delicious! I do not like the canning process and never know what to do with extra jalapeños, so thank you! My husband, a huge fan of jalapeños, really enjoyed it. We used the relish on top of corn cakes. It gave them subtle heat! I also added an extra garlic clove. I imagine it will be even better today after marinating for 24 hours! This stuff is the bomb! Spoon, jar, mouth! That good! I leave 1or 2 jalapenos with all the good stuff to give it a kick. The bomb?! Love that! Thanks for your review.